The Carnegie Foundation for the Advancement of Teaching was established in 1905 and chartered in 1906 by an act of Congress as an independent policy and research center called to “do and perform all things necessary to encourage, uphold, and dignify the profession of the teacher and the cause of higher education.” Today the Foundation seeks to build a field around improvement science and networked improvement communities that solves important problems of educational practice. 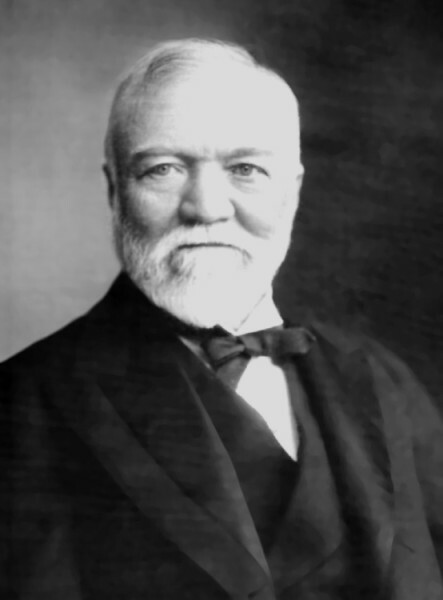 Andrew Carnegie—an American industrialist and a leading philanthropist of his time—created the Foundation to address what he perceived as a pressing issue on the education landscape at the time: the lack of any form of retirement plan or system for the faculty at institutions of higher education. His concern first surfaced as a trustee of Cornell University and through conversations with his friend Henry Pritchett, President of the Massachusetts Institute of Technology, that made evident the low salaries of higher education faculty and the glaring poverty into which most professors retired. As a result, Carnegie established the Foundation as a general pension fund for a wide range of universities in the United States, Canada, and Newfoundland. To move forward with its mission, the Foundation found that it needed to determine which schools qualified as a bona fide institution of higher education and which of their faculty qualified for pensions. The resulting eligibility standards created by the Foundation became the most widely used basis for the admissions requirements and instructional policies of colleges and universities, as well as the graduation requirements for high schools. Higher education institutions soon adopted what came to be known as the “Carnegie Unit” to measure students’ progress through a course of study in terms of Carnegie credit hours—a measure in which one hour per week of contact between student and faculty equaled one credit. This early impact of these standards on educational organization and practice in secondary and postsecondary education in the United States continues to this day. In 1918, the Foundation spun off the pension fund as an independent not-for-profit organization known as TIAA-CREF (now known as TIAA) that serves as the world’s largest retirement management system for academics, researchers, and individuals in the public serving not-for-profit sector. TIAA has served as a model for numerous other employee retirement benefit systems, and many of its structural elements and procedures were influential on the first federal oversight of such plans, the Employee Retirement Income Security Act of 1974 and its attendant regulations. Throughout its more than 110-year history, the Foundation has made a number of contributions to the field of education generally and higher education in particular. The most significant of these are briefly summarized here. Henry Pritchett, first President of the Foundation, commissioned several studies that revolutionized the field of medical education. First among these, in 1910, was Abraham Flexner’s Medical Education in the United States and Canada—more commonly known as the Flexner Report—which exposed wide variation in admissions requirements, curricula, facilities, assessment methods, and graduation requirements across the 155 medical schools in operation at the time. Flexner recommended that physician training be standardized and composed of education in biomedical sciences paired with clinical practice in academic hospitals. The report ignited protests and debate across the country, but it ultimately resulted in higher standards for medical schools and a complete transformation of the structure of medical education to that which exists today. The release of the Flexner Report created an interest in studies of professional education in other fields. In 1918, the Foundation commissioned and published A Study of Engineering Education, which argued for a revised common curriculum that emphasized science and the practice of applying the principles undergirding engineering in the field, adequate training for teachers of engineering, and the creation of objective admissions tests. The report led to the founding of the Engineer’s Council for Professional Development in 1932 (renamed the Accreditation Board for Engineering and Technology in 1980). Today, technical professionals from ABET’s member societies develop the criteria used in accrediting university engineering programs. In 1915, the Governor of Missouri and the state’s Department of Education invited the Foundation to study the conditions of the state’s “normal schools”—that is, teacher-training colleges. Released in 1920, The Professional Preparation of Teachers for American Public Schools: A Study Based Upon an Examination of Tax-Supported Normal Schools in the State of Missouri, known as the Missouri Study, examined the process of teacher preparation and recommended that normal schools focus on the professional preparation of educators rather than on other academic work. This report led to the first steps toward the professionalization of teaching, the transition of normal schools to teacher colleges by the 1930s, and the eventual incorporation of teacher colleges into schools of education within universities. In the 1920s, the Foundation commissioned William Gies, a biochemistry professor at Columbia University to conduct the first study of dental education. The resulting report, Dental Education in the United States and Canada, The report revealed the critically low standards in most dental schools. From this report came recommendations that each incoming dental student have a minimum of two years of postsecondary education, that biomedical science be included in the dental curriculum, and that dental schools receive support from universities along the same lines as the support given to medical schools based upon the Flexner Report. The Gies Report spurred the implementation of higher requirements for admission and accreditation and established dentistry’s place as an essential component of higher education in the health professions. In 1914, at the invitation of the American Bar Association, the Foundation conducted a study leading to the publication of its influential report, The Common Law and the Case Method in American University Law Schools. It recognized the significant strengths of the case method, while also cautioning against an overdependence upon it, which would not sufficiently prepare students to see the law as a dynamic entity and understand its role at the intersection of history and ethics. The case method is the foundation of most law school classes today. In 1937, under the leadership of then President Walter Jessup, the Foundation extended its work in professional education by developing and administering the Graduate Record Examination (GRE) to assist universities in their graduate school admissions processes. The Foundation continued to administer the exam until 1947, when it collaborated with the College Entrance Examination Board and the American Council on Education to create the Educational Testing Service, which continues to administer the GRE (along with numerous other admissions-related examinations). The Carnegie Foundation founded the Carnegie Commission on Higher Education in 1968 and the Carnegie Council on Policy Studies in Higher Education in 1973. Led by Clark Kerr, former President of the University of California, these bodies together published more than 120 significant reports and studies on higher education in the United States. Eleven of these reports specifically addressed equality of opportunity in higher education, beginning with the influential Quality and Equality: New Levels of Federal Responsibility for Higher Education, which advocated for and contributed to the creation of policies that increased access to higher education. One of these is the Federal Pell Grant Program, which remains the largest source of federal grant aid to low-income students for undergraduate education. Another example is the Fund for the Improvement of Postsecondary Education, which was established to improve secondary educational opportunities and still continues to fund the development and dissemination of strategies for supporting all students, particularly those at risk of not completing their programs of study. In 1971, under the leadership of Clark Kerr, the Carnegie Commission on Higher Education developed a classification system for describing colleges and universities. Initially intended to support research and policy analysis, the Carnegie Classification uses empirical data about characteristics of students and faculty and the work of the institutions to identify categories of institutions based on function and mission, including doctoral-granting institutions, comprehensive universities and colleges, liberal arts colleges, two-year colleges and institutes, professional schools, and other specialized institutions. The classification system, periodically updated, functions as the most prominent framework guiding the study of higher education by describing and controlling for institutional diversity. The system itself has grown to include classifications of instructional program, enrollment profile, size and setting, and certain “elective” classifications. In 2014, the Foundation transferred administrative responsibility of the Carnegie Classification System to the Indiana University Center for Postsecondary Research. Under the leadership of then President Lee Shulman, an Elective Classification for Community Engagement was created as a part of the 2005 overhaul of the Carnegie Classification. It is a voluntary, evidence-based documentation of institutional practice related to community service and engagement. Responsibility for administering the Elective Classification for Community Engagement was transferred to the New England Resource Center for Higher Education (University of Massachusetts at Boston) in 2014 and subsequently to the Swearer Center for Public Service at Brown University in 2017. After the publication of two reports on the experience of students within the education system (High School: A Report on Secondary Education in America in 1983 and College: The Undergraduate Experience in 1986), President Ernest Boyer turned his attention to related scholarship. In Scholarship Reconsidered: Priorities of the (1990), he called for a reformation of academic scholarship by challenging the traditional roles of faculty as scholars. He argued that this role created an incongruity between the increased pressure on faculty to produce publishable work and the mission of colleges and universities to promote the intellectual and moral development of an increasingly diverse populace. His writing persuaded many colleges and universities to reexamine and revise the standards by which they judged faculty work. This work was followed by the 1997 publication of Scholarship Assessed: A Special Report on Faculty Evaluation, in which authors Charles Glassick, Mary Taylor Huber, and Gene I. Maeroff described the changing nature of scholarship in institutions of higher education. Under President Lee Shulman’s leadership, the Foundation expanded on work done in its first 100 years by becoming a center for the advanced study of teaching at all levels and across many disciplines. As part of this renewed focus on the scholarship of teaching, the Foundation launched the Carnegie Academy for the Scholarship of Teaching and Learning (CASTL) in 1998, which included programs for campuses and disciplinary associations, national fellowship programs for teachers in K–12, and collegial associations in which college and university faculty in diverse fields came together to develop a scholarship of teaching and learning. A collection of Shulman’s writing, The Wisdom of Practice: Essays on Teaching, Learning and Learning to Teach, received the University of Louisville’s Grawemeyer Award in Education in 2006. At the same time, the Foundation launched the Preparation for the Professions Program—a multiyear study of professional education that would compare approaches to teaching and learning across professions. Reminiscent of the early-20th-century reports following the Flexner Report, these new studies examined the preparation of physicians, engineers, lawyers, teachers, nurses, and the clergy. The Foundation also turned its attention to studies on doctoral education, working with leadership teams from over 80 departments in six fields (chemistry, education, English, history, mathematics, and neuroscience). The Carnegie Project on the Education Doctorate (CPED) engaged more than 50 schools of education in a critical evaluation and redesign of the Ed.D. to increase the degree’s relevance for faculty and leaders in school systems. Today, the University of Pittsburgh houses CPED, which is made up of 105 institutions in the United States, Canada, and New Zealand. Anthony S. Bryk—the Foundation’s current president—and colleagues have undertaken the transformation of the research and design enterprise to forge a more productive relationship between research and practice. Recognizing the need for improvement efforts to be implemented effectively, reliably, and at scale (while addressing the impact of local context and conditions on even good ideas), as well as the proliferation of specialized knowledge and with it the increasingly complex nature of education systems, the Foundation seeks to balance all of these factors as it addresses the great challenge of making systems work with coherence and integrity. The Carnegie Foundation has established a number of NICs to understand how to translate the organizing principles of NICs into routines, tools, processes, and social arrangements that yield effective, scalable improvement. These NICs included efforts focusing on mathematics education in higher education, teacher preparation and induction, and student support services in higher education, as well as numerous efforts in pre-collegiate education. This pioneering work has led to widespread interest and a movement to advance networked improvement science as a strategy for realizing positive change at scale in education. Key principles have been incorporated into federal legislation and regulation, advancing networked continuous improvement. Improvement networks have been adopted as an organizing structure for guiding the large-scale efforts of private philanthropies, and a scholarship is now emerging that examines networked improvement science—all suggesting the potential for this work to make a contribution to the field that is deep, widespread, and enduring. Boyer, E.L. (2015). Scholarship Reconsidered: Priorities of the Professoriate. San Francisco, CA: Jossey-Bass. Bryk, A.S., Gomez, L.M., Grunow, A., & LeMahieu, P.G. (2015). Learning to Improve: How America’s Schools Can Get Better at Getting Better. Cambridge, MA: Harvard Education Press. Carnegie, A. (2006). The Gospel of Wealth. Signet Edition. New York, NY: Penguin-Random House. Carnegie, A. (1986). The Autobiography of Andrew Carnegie. Boston, MA: Northeastern University Press. Flexner, A. (1910). Medical Education in the United States and Canada: A Report to the Carnegie Foundation for the Advancement of Teaching. Reprinted 2018. London, UK: Forgotten Books. Lagerman, E.C. (1999). Private Power for the Public Good: A History of the Carnegie Foundation for the Advancement of Teaching. New York, NY: College Entrance Examination Board. LeMahieu, P.G., Grunow, A., Nordstrum, L.E., & Baker, L. (2017). Networked improvement communities: The discipline of improvement science meets the power of networks. Quality Assurance in Education, 25(1). Mangan, B.F. (2005). Fund for the improvement of postsecondary education: Background and funding. Washington, DC: Congressional Research Service. Shulman, L.S. (2004). The Wisdom of Practice: Essays on Teaching, Learning, and Learning to Teach. San Francisco, CA: Jossey-Bass.